I have always wanted to imitate/compete/improve upon Frank and his T206 Monster. I have been on and contributed to this board since it was created, and was on the old Full Count board before that, so I definitely have the hobby stamina required to maintain such a thread, just like Frank has proven to have. I have always loved the E90-1 set, and have collected it off and on for over 25 years. 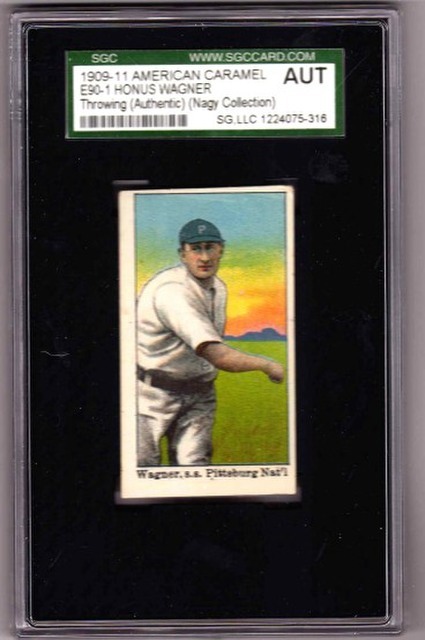 Of course since the E90-1 set has nowhere near the popularity of the T206 set, the views will pale in comparison to the Monster thread, but I think the E90-1 issue has enough of a following and is full of varying scarcities that are still being pinned down that I think it will at least keep a portion of Net54'ers interested. I have given point values based mainly on popularity with a good dose of perceived scarcity thrown in, giving a nod to traditionally acknowledged scarcities and tossing in a few common players that have been revealed in the recent years as being tougher/more desirable. I decided to include the 13 commons worth 3 points each with the understanding that there are another dozen or so candidates that might be included, but didn't want this thing to get too cumbersome. Likewise various other Hall of Famers count as 1 point, but most of these are either fairly common or not as popular. Let me know what you think about all this and what you think about my point system (as potential Kraken master I will listen to suggestions, but of course I get the final say like any good E-Monster would). To start off, my E-Monster # is 164. I own all 88 of the 1 point cards, 15 of the 3 point cards (missing the Miller sunset), all 4 of the 4 point cards, and have the 5 point Cobb, Clarke Pittsburgh and Stahl cards. 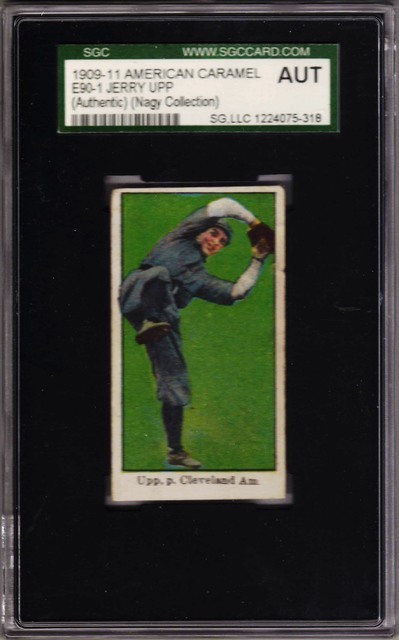 This post is a list of E-Monster #'s of collector's E90-1 cards currently in their collection. I will update this list frequently when people post their #'s. 250 points indicates a complete set. This number is my initial post, I think it’s correct. As Cory (my e90-1 hero) knows, tomorrow’s mail should get me there. I’ll correct it as needed. Maybe I could hit the century mark just by a boost to Overall’s weighting. He’s tough. Hi Brian...thanks for sparking my E90-1 fancy. I agree with the Overall, I left him out previously because, although he has been noted as a tough card, it seemed like I had seen a lot of him available over the years. He is still not an easy one, and his perceived scarcity is up there, so I have added him to the 3 point list. Doing a little more tinkering, I upgraded the Stahl, Sweeney (Boston) and Graham from a 3 point value to 4 points, as I feel these in the past they have been perceived as extra tough and their prices are strong. 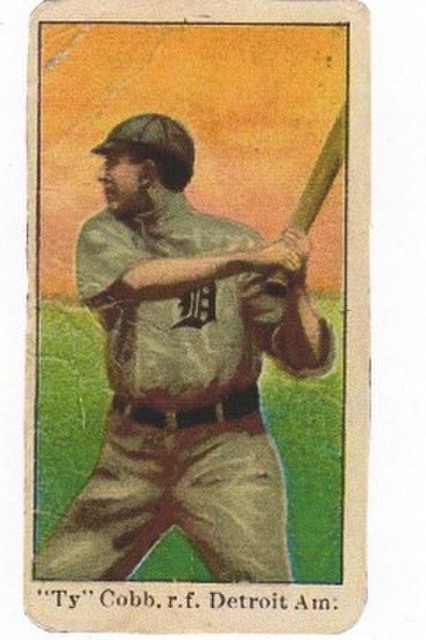 I also added 5 more points to Joe Jackson so now he is at 25, because, ugly or not, this is considered his rookie card and people go nuts for it even if it is not scarce. The complete set now totals to 250 points. I have updated AddieJoss # to 225 (correct me if I am wrong...I assume Joe is the missing one) and adjusted my own score as well. Brian, when you recalculate your score let us know. Last edited by brianp-beme; 11-21-2017 at 12:16 AM. I don't disagree with Any of these except maybe Plank as I've found him to be plentiful and not too pricey. I would add Bemis as a toughie, Clement as a minor toughie, seigle as tough, O'Connor as a pretty tough card, and Howell wind-up as definitely tough. Cards that should only be worth half a point as they seem to be everywhere: bresnahan, dooin, Krause, Fred Mitchell, stange, stone (no hands), summers, and Wallace. You are probably correct on the additional scarcities... but I think I will have to hold the line somewhere. It is good that at least an advanced collector of the set like yourself has noted them as being tough. And although I'm not going to do it, those cards you mention that should only be 1/2 point is spot on. If you want to own an inexpensive and easily obtainable Hall of Famer from the E90-1 set, Breshnahan and Wallace are just the ticket. And the Krause, Fred Mitchell, Stanage and Summers seem to pop up as often as holidays do in many foreign countries. I list the tough cards more for knowledge out there for those putting the set together. It's a great set to work on. 183, but I've only been at it for 34 years. Excellent list overall, especially noting the red Keeler is tougher than the throwing version. Conventional wisdom states otherwise. I would argue for Seigle over Stone and agree on the availability of Plank. Great stuff, Brian. SGC has weighted this set as part of their set composition. I believe their weighting to be very accurate. I'm at 91, as I have all the HOFers except Young (Cleveland), and Buck Jordan. Thanks for the participation and suggestions so far. I am still at the slight adjustment and Tinker phase (Joe will be remain at the 1 point status, no Chance for him to Evers elevate up to the 3 point level). I am willing to shorten the Plank from 4 to 3 points in length. As a result, I would like to elicit suggestions on which card that is currently 3 points that would be the best candidate to be elevated to 4 points. Also, I would be willing to drop the Stone down to the 1 point depth. What would your best candidate be to elevate from 1 point to 3 points? After your input on these potential slight adjustments I will set the point system into cement. Hi Paul, I will have to check their site out for their ranking. Hi Brian, I guess you could say it's just another input to use. I'm not saying it's perfect, but I have had some input in making minor adjustments to it over the years. I’d keep Stone up there and add Bemis, clement, o’connor, Seigle, Howell (wind-up) for 3 points each. Lower Plank to 3 points and Jackson to 20. Just my perspective. Either way, fun set. Outsider looking in, been there done it. I would lower the Cobb, it's not tough and raise the Stahl and Walsh a level. Hope the thread generates more interest in the set. Pending any scoring changes, the re-ranking of Overall puts me at an even 100. I like the weighting here more than SGC, although some are equivalent. SGC weighs all HOFer at 3, and we know that Wallace, Bender, Bresnahan and Crawford are easily found...and not as key to set completion as some of the toughies weighted above. Surely there are more e90-1 collectors out there? 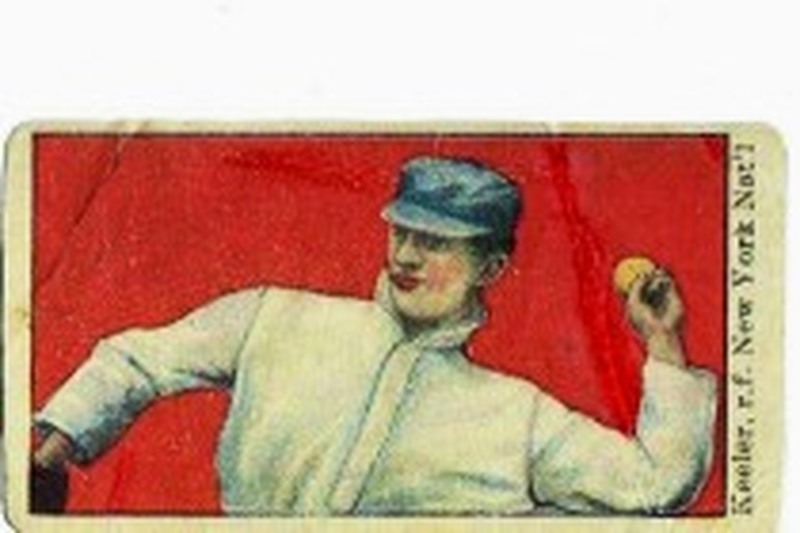 Ty Cobb was printed in the 1st series (ca..1908). Cards in this series are quite plentiful. I think Joe Jackson was most likely printed in this 1st series, also. Therefore, I think their #'s should be decreased. 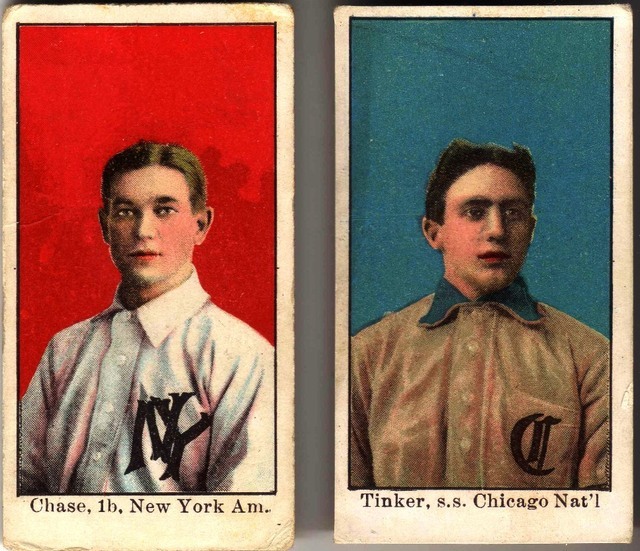 And, Hugh Duffy and Tris Speaker are short-prints issued in the last series (circa..1910), and both their #s should be increased. Anyhow, do I get any credit for my 1st set (120 cards) even though I sold it ? I'm still finding cards in my current set. When I have gathered all of them, I will provide you a number for this 2nd set. I don’t know when this was, but I assume it was when the Joe Jax was priced better than its ridiculous number now. While there seems to be at least some mild interest in the set, we haven’t gained a lot of contestants for the Kraken! I'm at 122, including a Miller with sunset variation and a Krause blank back. A complete number one SGC set. Don't know how many points that is. since E90-1 cards were not a "hot item" back then. And, as you know, Joe Jax cards went "bonkers" after these movies were shown in the late 1980's. Anyhow, I leave to Brianp to decide if my former set qualifies being on his list. I sold the 120-card set to Mike Wheat at the Fort Washington Philly Show. You're crack'n me up, but I'll check in with a Kraken # of 3. 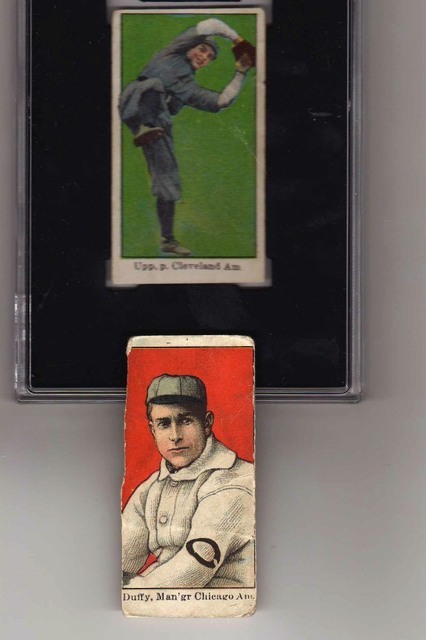 I decided to keep the Stone (left hand) based upon suggestion, and decided to keep Plank at 4 (although readily available, it is still fairly popular as an alternative to his T206 card). So the set total remains at 250, a nice number to target for. I was tempted to add all of the suggested 1 to 3 point changes Cody mentioned, but that shiny 250 number beckoned. A complete set of 120 cards plus two known variations......so I guess it would be the max points plus some bonus points. Please raise me to 93. Also, you should remove Ty Cobb from the 7 point section, since you moved him to the 5 point section. Way back when, I remember the Mike Mitchell card was considered the key to the set. 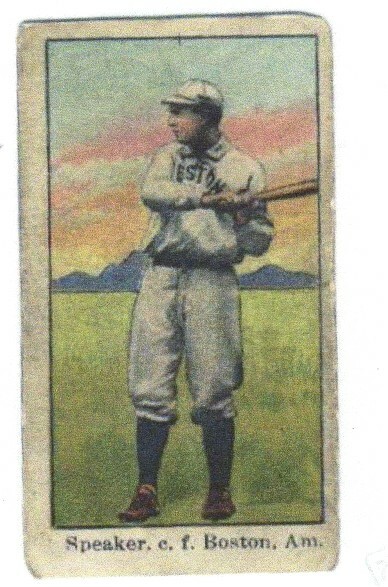 Lew Lipset even referred to it as the T206 Honus Wagner of the caramel cards. There doesn't seem to be so much interest in it these days, or at least that is my impression. Maybe that is because so few come to market. Any Mitchell stories? Thanks Steve for pointing out Cobb...looks like he was trying to swipe a few extra bases. Your Kraken # has also been updated. I think time has proven that the Mitchell card is just not as scarce as it at one time seemed. 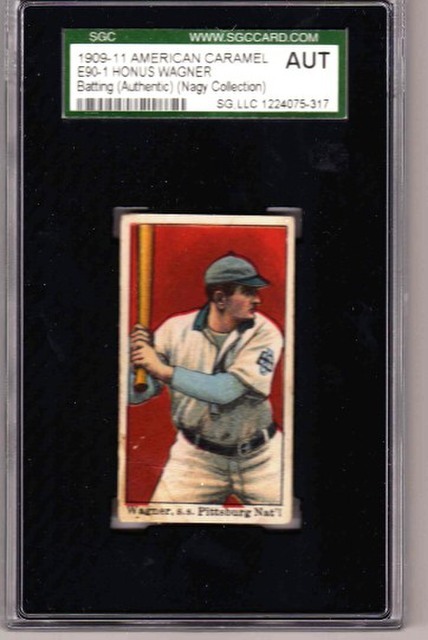 The grading company #'s certainly seem to indicate it is not as tough as some other cards, but I think that is partially because a bigger percentage of Mitchell cards are graded, because of its reputation and the higher dollar amount the card brings when sold. That is why I believe it is justified to have him at the higher 7 point level...people are still willing to pay the $ for him, but just not as much as previously. If not for the reputation, I think I would have placed it at the 5 or 4 point level. Last edited by brianp-beme; 11-27-2017 at 11:47 AM. The Mitchell card is tough but available in lower grade. I would say that above a VG 3 grade, it gets very tough. Thanks for including me on your list with "honorary mention". That's fine, since I don't have the set anymore. Shean, Speaker, B.Sweeney, Stahl, Upp, Walsh, etc. I'll provide you the numbers on my current set later today (or tomorrow). You can put me down at 4.....but highest graded should get at least another half point!! Feel free to post scans of your whole E90-1 collection, and I can break out the abacus and figure out your E-Monster number. Here is an example of the Kraken Abacus in action. Please view the below scans. Note that in the top row Cobb is worth 5 E-Monster points, while the Graham and Plank are worth 4 points each. Each card in the second row (Karger, Shean and Joss throwing) are worth 3 points each. The bottom row of Schlitzer, Hartzell and Donovan are worth 1 point. A few quick flips of the wrist on the Kraken Abacus would result in assigning this collection of 9 E90-1 cards 25 E-Monster points. Please note that condition is not relevant, nor are cards missing large portions downgraded (For example Cobb is still worth 5 points despite the fact that in actual cardboard material he would likely be only equivalent to 4 points, and the Karger would still be 3 points instead of 2.25 points). The next Kraken Abacus calculation can be yours. You may consider the condition of the Cobb irrelevant, but I have never cared for an abdominal gunshot wound victim, who would agree with you. Please revise me to 187. Picked up four points without adding a card. My gut reaction: I miss that Cobb - but it couldn't be in better hands. All true, but what Paul fails to mention is that Cobb is the true hero in this story...he took the blunt of the attack for his fellow E90-1 ballplayers, but there was still some collateral damage. Hmm...I build a spreadsheet to tabulate all of our Kraken numbers but something isn’t adding up. But my excel sheet only makes these add to 244, not the coveted 250. I looked twice , maybe three times but it’s after midnight here...anyone care to check the math again? To that point, I might have missed something but I have this electronic abacus file available to share so you can easily calculate your own Kraken number, just by clicking either “have” or “need”. There’s even a pie chart and some math formulae to help determine how close you are to the set, and the percentage of common (one pointers) versus “toughies”. Let me know if you’d like the sheet... of course it needs to be fine tuned since my dreary eyes only see 244 points! Ouch. Tony and Brian (not me) are correct. I should stop messing with new math and just figure out things the old fashioned way, utilizing a series of fingers and toes. I checked my abacus and some of the little discs have chunks missing from them, which I assume affects performance as well. I regrettably need to revise (and set in concrete, and then put some sort of concrete shellacking material over top, if such a product exists) the point tallies to reflect this. The complete set should come to 250 points (please double-check me!) and anyone who sees their name on the Kraken list with a 'subject to change' needs to re-figure their official set number. It looks like we have finalized the Kraken number and we're ready to go! So I've created the modern abacus to help track the complicated Kraken Calculation. It doesn't appear as if I can upload a MS Excel file on to this site, so anyone desiring this spreadsheet can simply email me. A PM with *your* email address will also work. My email address is my net54 user name at comcast dot net. The familytoad Kraken number now sits at 110. I don't have scans handy, but I'll add some of my low grade beauties as time allows. This is a snip of what the Kraken Abacus looks like. Mine shows 110 of the possible 250 points. 44% of the Kraken. I have 77 of the 121 cards, or 63.64% of the actual set. I also have 40% the toughies. More pie charts will likely come with future versions. My current set (2nd set) consists of the subjects on display here, and 44 commons. Therefore, if my math is correct, my # is 93. I just updated my Excel spreadsheet, adding all 121 cards to it (previously, I just had the cards I actually own reflected on it), and including the weighting in Brian's first post. I got a total number of 250 also, so it looks like the numbers are correct. My number of 93 is also correct. Last edited by Steve D; 12-02-2017 at 04:29 PM.